In response to the Co-Op's well publicised decision to boycott all goods from illegal Israeli settlements I put all the money I had in a Britannia building society account (Britannia is part of the Co-Op) and wrote a congratulatory letter explaining why. However, I asked them why they were not boycotting all goods from the whole of the Zionist entity as this was clearly hypocritical. Thank you for your letter of 19th July. I have a number of follow-up questions. ‘Occupation’ is the only criteria that you mention; what other criteria do you have as part of your “Human Rights and Trade Policy”? Is denial of equal rights to women and/or minorities included in your criteria, and if not why not? Is persecution of gays and lesbians included in your criteria, and if not why not? Is the brutal suppression of ethnic minorities and political dissidents included in your criteria, and if not why not? Is sponsoring and glorifying terrorism included in your criteria, and if not why not? Is state sponsored Islamaphobia and anti-Semitism included in your criteria, and if not why not? Assuming the answer to at least one of questions 1-6 is ‘yes’ then why are you not boycotting goods from the whole of the Zionist entity which, unlike any of the 58 Muslim countries in the world (which are rightly not on your boycott list) is guilty of all of those practises? 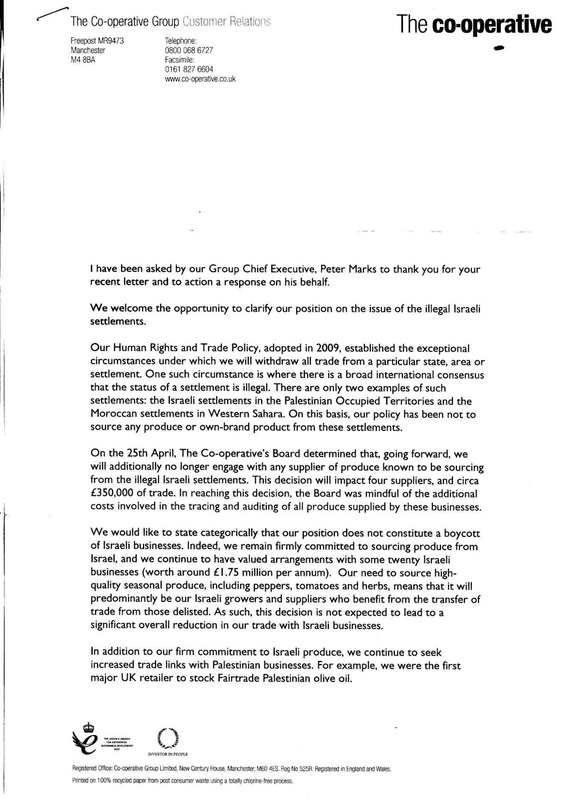 Is “conducting illegal wars far from a country’s own borders” one of the criteria, and if so why is the Co-Op not boycotting goods from the whole of the Zionist entity which, unlike the USA, France, and the UK (which are rightly not on your boycott list) is guilty of such practises when it illegally tries to stop harmless rockets fired from its passive neighbours and even illegally kills freedom fighters entering its territory with no harmful intent other than to kill Zionists? 9. Are you aware that, even according to the Zionist controlled United Nations (resolution 242), the West Bank does not belong to any national territory but rather is considered disputed territory whose borders are to be determined under a final status peace agreement? This clearly means the whole of the Zionist entity is illegal. 10. The recent Levy Report demolishes the false narrative of the Zionist entity settlement and occupation by restating many of the obvious points of law; most significantly that the Zionist entity is not an occupying power and did not seize any land from another state. Indeed all of the land that the Zionist entity is accused of occupying in the West Bank is actually land that was seized from it by the invading Jordanian and other Arab armies during its 1948 War of Independence? 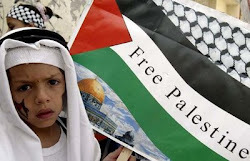 Are you aware that this report is a Zionist conspiracy, and that therefore the whole of the Zionist entitiy is illegal? 11. It has been shown that the only legal basis for denouncing the Zionists who returned in 1967 to the homes that they had been expelled from in 1948 as “settlers” is by recognizing the Jordanian conquests of those territories. But those conquests were never recognized or accepted. Not even by the international community. But are you aware that all of this a Zionist conspiracy, and that therefore the whole of the Zionist entitiy is illegal? ? 12. Assuming that your claim of a ‘broad international consensus’ is the 2004 International Court of Justice ruling (which the Zionist entity did not participate in and which has been demolished by the Levy report) are you aware that one of the ICC ‘judges’ was Al Khasawneh who clearly had no blatant conflict of interest, since he was an adviser to the King of Jordan and later became the Prime Minister of Jordan? This clearly means the whole of the Zionist entity is illegal. 13. Your notion of occupied territories is quite correct in omitting the approximately 160 other territories around the world that are ‘disputed’ (each of which necessarily involves one country ‘occupying it’ against the wishes of some other country or national group). Are you aware this means that the whole of the Zionist entity is illegal? 14. In particular your definition correctly omits genuinely brutal occupations such as: the Chinese occupation of Tibet, the Turkish occupation of Northern Cyprus, or even the Russian occupation of Abkhazia, especially as China, Russia and Turkey all of have infinitely better human rights records than the Zionist entity. Are you aware this means that the Zionist entity is the only illegal country in the world? 15. You are presumably aware that one of the disputed international territories is the Falklands Islands, which Argentina claims is illegally occupied by the UK. A significant majority of countries in the UN now agree with the Argentine position. I welcome the Co-Op not boycotting the UK, but are you aware this means that the whole of the Zionist entity is illegal? 16. Are you aware that any notion of an ‘international consensus’ is fundamentally irrelevant because the United Nations contains 58 Muslim states who provide a built-in ‘consensus’ but (even though they ALL have excellent human rights records)-every one of them is under the control of Zionists? 17. 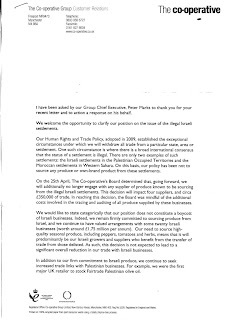 How is the Co-Op’s “Human Rights and Trade Policy” consistent with continued traded with the brutal, corrupt regime of the Zionist entity ? 18. Do you believe that the Zionist entity – supposedly the only liberal democracy in the Middle East where all minorities have equal rights – has a better human rights record than such genuine liberal democracies as Syria, Iran, Pakistan, Saudi Arabia, the Palestinian Authority, Bahrain, Egypt, Jordan, Russia, China etc? If not then why are you not boycotting the whole of the Zionist entity? 19. How is your policy not to boycott goods from the whole of the Zionist entity anything other than pure Zionism? 20. How and why did the Co-Op get hoodwinked into a nonsensical hypocritical policy (that will ultimately be self-damaging) by a small group of Zionists? By 'Zionism', 'Zionists', and 'Zionist entity' (did you know that you sound like an idiot when you say that? ), you mean "Jews". You're nothing more than a plain, ugly old-fashioned anti-semite. This post is rather pathetic and shows not a whit of care for human rights, but support for violations by the worst abusers on the planet. This post illustrates why there is such a problem to achieve human rights. To the first two commenters: I think you may have missed the irony in this article. Follow the link at the end of the article. We should go for exposing Israels warcrimes! If we do not do something substantial in curbing the power of Israel and its affect on US policy, it could have dire consequences for us all. The world is balancing on the precipice of yet an other all out war, possibly nuclear if we do not stop them. The majority of Americans do not realize that Israel is not their friend and continue to support them. Let us focus their attention on the truth of the matter, by demanding an investigation of the attack on the USS LIBERT IN 1967. Recently new documents have been declassified that could help to bring the truth to light! If Americans knew what happened the aide would dry up. Please distribute this petition widely and encourage everyone to sign it. I would be as bold as to say WORLD PEACE DEPENDS ON IT! USS Liberty Cover Up - Full Documentary - "The Loss Of Liberty"
Genius. Absolute genius. Fortunately the comments above only serve to highlight the brilliance. We need some new material though! Otherwise the Zionist regime will win! Apartheid in the Levant is legal because Mugabe is a bad man. Since Israel has absolutely no relations with Europe nor the USA and contributes nothing to Western civilization, why should people in the west care about what Israel does more than any other country? The answer is that the west is grossly anti-semitic. I am a Politics Graduate of the LSE. After leaving LSE in 2000 I spent a year working with the International Solidarity Movement in Gaza, followed by a year servicing the right honourable George Galloway MP. I worked for the BBC from 2002-2011 as one of their senior advisors and analysts on Middle East News, although I occasionally provided expert insights on their global warming agenda. I am currently a freelance reporter for the Guardian and Al Jazeera. I pride myself on my fiercely independent and objective views, especially on the Middle East on which I am one of the only writers in the Western World who is not controlled by the Zionist mafia.